Kids bath tub toys take the tears and tantrums away from bath time and make it enjoyable and engaging. 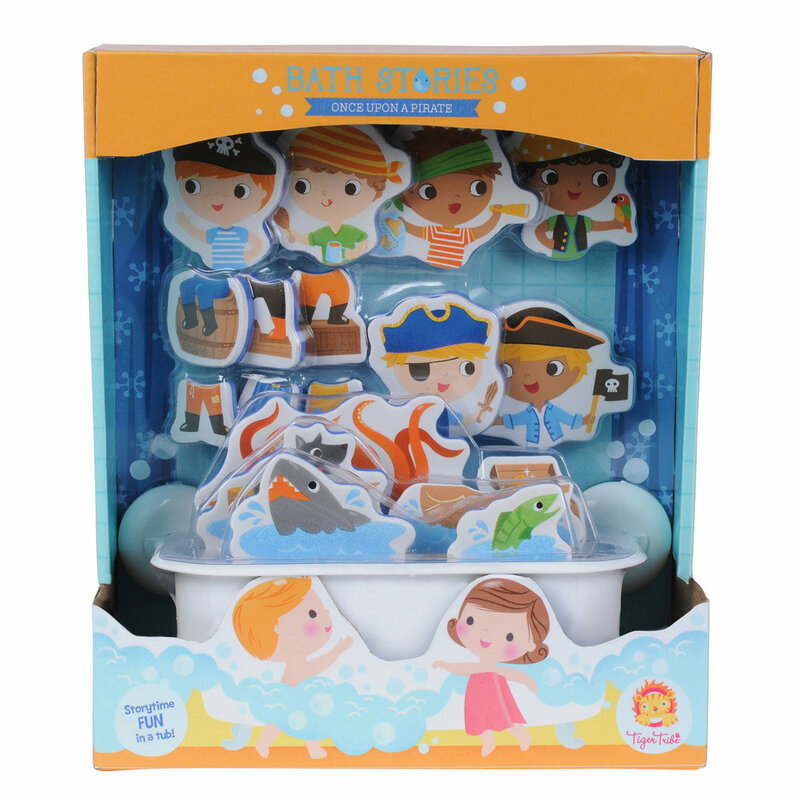 Tiger Tribe’s wonderful Once Upon a Pirate bath stories will have your little pirates going “Arrr” in the tub with ease! This adorably cute and wonderfully made set of 18 mix-and-match pirate-themed pieces will delight little ones as they splash in the tub. Making stories with this bath tub toy will come easily to little ones, thanks to the large size and the sweet illustrations. Bath time can be a time to make many memories with our babies. These delightful bath tub toys take away the tears and help create those happy moments that kids can look back on. Using the Bath Stories tub toys to make stories will help kids to develop their language skills, vocabulary and creative thinking. Plus, you can teach them clean up skills too by encouraging them to put the stickers away after bath in the handy plastic tub-shaped container! Includes handy bath-shaped plastic container with drainage holes and suction cups for easy drip-dry storage.